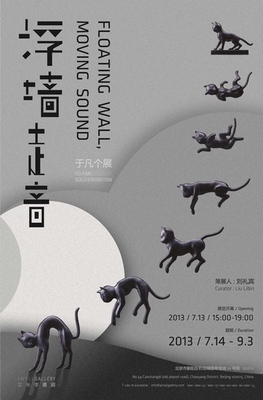 Amy Li Gallery, Beijing, presents YU FAN Floating Wall, Moving Sound. As Yu Fan's first solo exhibition in Amy Li Gallery, it showcases five sculpture works including two very recent works Black Cats and Sitting Girls, which represent Yu Fan's new exploration of sculpture language. The exhibition is curated by Liu Libin - PHD of China Central Academy of Fine Art, well known art critic. The main difference of “Sculpture” as an art form from other artistic expressions is that: the sculptor reflects and creates on the basis of “physical form”, and the public sees it and perceives it on that same basis. The reality and fiction are two extremities of the “physical form”, and behind that lies the fascination of Yu Fan for extremities. If we consider “volume” as a straight line, reality and void are each at one end of that line. Take one point on that line, apply a rotation, and the two extremities are bound in a circle. Several “straight lines” then make a round surface, and that is three dimensional Yu Fan. These many lines could be internal questions about the art of sculpture, They could also be clues to Yu Fan's life, like career, ideals, etc. Each of these lines has two ends, the combination of which forms the borderline of the round surface. Yu Fan has a special predilection for this, and he touches it lightly, carefully. This “light and careful touch” is related to the atmosphere of vigor or pounding, sensitivity or morbidity that transcends his works. Relief sculptures represent a large proportion of Yu Fan's works, and in this exhibition four works have been selected: Arthur in uniform, Leifeng Pagoda and Lily, Black Cats and Sitting girls. One can say that the first two still exudes the familiar characteristic of Yu Fan – namely freshness and purity, Black Cats and Sitting girls materialize Yu Fan's perspective, Black Cats shows a cat on a pedestal, and fixes seven positions of the cat falling to the ground. Chinese people believe that black cats can chase away evil spirits and sent them down South, making generations safe. But the fall of Yu Fan's black cat, its fear of falling, makes it seem closer to the Western interpretation. Sitting girls is composed by 16 girls’ relief sculptures. These girls are fashionably dressed, and are all in a reserved but desiring position, seemingly eager for something, to a certain extent, however keeping it in unspoken modesty. This again reminds me of Yu Fan “light and careful touch” towards the circumference. There are another two sculptures in this exhibition: Crane No.1 and Crane No.2. One is looking down, the other up, which corresponds precisely to what I was mentioning above, the reality and the void. Place Yu Fan's works in an exhibition hall, and not only the relief sculptures will float, so will the walls; not only will you hear the sounds of nature, very clearly, these sounds will begin to move. YU FAN is one of the most important artists leading the trend of chinese sulpture art. He was born in 1966 in Qingdao (Shandong province of China)，graduated from the Sculpture Department of CAFA, currently works and lives in Beijing as vice director and professor of CAFA's Sculpture Department. His works have participated in numerous important exhibitions and art fairs in China and other countries, many of them have been collected by important art institutions.